Photograph of the Ta 152 H WNr. 150 167, which was considered for conversion to the Ta 152H-10 reconnaissance standard. From Dietmar Harmann's Focke-Wulf Ta 152. As the war was coming to an end for Germany and the plight of the Japanese armed forces grew ever bleaker, a very large influx of the latest aviation technology Germany had to offer was given to or bought by the Japanese air forces in the hopes that it would stem the tide of defeats and ever increasing pressure to put up superior aircraft to battle the newest airplanes the allies were putting into the field. One such German aircraft was the Focke-Wulf Ta 152, whose blueprints were purchased by the Japanese in April of 1945. The development of the Ta 152 ( the Ta stood for Kurt Tank, the designer of this aircraft ) came about as the Luftwaffe saw the threat of high-altitude bombers and reconnaissance aircraft which could be fielded by the allies and which would prove difficult, if not impossible, by current Luftwaffe interceptors to engage. Thus, even before high-flying allied bombers began operations over Europe, the German aviation industry was hard at work exploring pressurized cockpits and cabins, turbo-superchargers, and other means to enhance engine performance at high altitude. Focke-Wulf was one of the major players who put great effort into these studies. Work began using the Focke-Wulf Fw 190 ( the B, C, and D models ), generating various schemes using pressure cabins, different engine types, and injection/supercharger methods. The work with the Fw 190B model proved fruitless and was dropped while the Fw 190C work proved much more successful but it was the Fw 190D which would provide the basis for the Ta 152 series. As the Boeing B-17 "Flying Fortress" began appearing in the skies and provided the Luftwaffe with intercept difficulties, German intelligence learned of the even more superior Boeing B-29 "Superfortress" and, even though the B-29 was never deployed to the European combat theatre, it proved a motivator to the Luftwaffe to come up with an answer for it. Both Focke-Wulf and Messerschmitt were asked to put forth proposals. Focke-Wulf offered the Fw 190 Ra-2 and Fw 190 Ra-3 while Messerschmitt put forth the Me 109H series. In the end, the Me 109H became a loser to the soon-to-be called Ta 152. Because Kurt Tank was a very influential and respected designer, aircraft which left his design boards would have the "Ta" prefix applied instead of the "Fw" prefix for Focke-Wulf. Such was Tank's sway that he was able to go around the usual aircraft naming scheme and his two models, the Ra-2 and the Ra-3, became the Ta 152B and the Ta 152H respectively. The basis of the Ta 152 was the Fw 190D airframe and throughout the life of the aircraft's evolution, various styles of wing, engine, weapon, and other changes were made to it. Common features included a pressure cabin for the pilot, provision for the GM 1 ( nitrous oxide injection ) kit or the MW50 ( methanol-water injection ) kit, hydraulic flap and undercarriage actuation, lengthened fuselage for increased internal capacity, enlarged tail surfaces, and a moved cockpit area to maintain the center of gravity. While there were many sub-types of the Ta 152, only the Ta 152H series will be discussed. My reasoning is that, while it is not known which model or models of the Ta 152 the Japanese purchased plans for, I would wager it was the H series. This was the high-altitude type, unlike the B and C models which were medium altitude aircraft and designated fighter-bombers as well as fighters. Because the Japanese were the only axis power to feel the effects and have to contend with engaging the B-29 in combat, it would seem logical that the ultimate German fighter which could battle at that height be desired. I recommend Dietmar Harmann's Focke-Wulf Ta 152:The Story of the Luftwaffe's Late-War, High-Altitude Fighter from Schiffer Books for the complete story of the Ta 152 developments and deployment. Because the Ta 152 was never built in Japan nor, for what is known, anything done with the plans they purchased, let alone if they even made it to Japan, I will only be glossing over the evolution of the Ta 152H series to give a foundation as to why the Japanese would have shown interest in it. 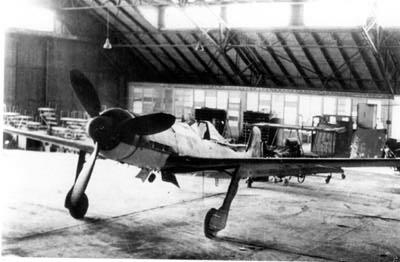 As noted above, many Fw 190 aircraft participated in the development of the Ta 152, testing powerplants, injection methods, and different aerodynamic properties. The Ta 153, a testbed aircraft originally called the Fw 190 Ra-4D, was the plane which initially tested the long-spanned wing which would be used in the Ta 152H. This wing featured a very simple manufacturing process and offered a much greater internal volume for fuel as well as being a marked improvement over other wing ideas for the Ta 152. So much so was this wing desired that it was standardized for the Ta 152 series, in part as it offered the potential to better handle the North American P-51 "Mustang". Work began on pre-production Ta 152H-0 at Sorau while the assembly line for production Ta 152H aircraft was readied at Cottbus. The first Ta 152H, the Ta 152H V1 and the second, V2, were completed in June and July of 1944 and the former sent to Langenhagen for testing, the other to Rechlin for official evaluation beginning in August. The first Ta 152 series aircraft left the production line at Cottbus was a batch of 20 pre-production Ta 152H-0s which were delivered in October and November of 1944 to Erprobungskommando Ta 152, commanded by Hauptmann Bruno Stolle and based at Rechlin, which would service test the airplane. At the close of November, the Ta 152H-1 began to roll off the lines, 34 being completed by year's end. It was not until January 27, 1945 did the first Ta 152 H models begin to trickle into Luftwaffe service, production being severely hampered by the rapid advance of the Soviets who ultimatly overran the Cottbus facility. Both the Ta 152H-0 and Ta 152H-1 were similar, the former having no wing tankage. Both used the Jumo 213E-1 engine, had an engine mounted 30mm MK 108 cannon, a 20mm MK 151 cannon in each wing root ( Revi 16b gunsight used, later to have the EZ 42 aiming system with automatic lead computing installed ), 330lbs. of armor protection for the engine and pilot, FuG 16ZY and FuG 25a radio equipment, and later Ta 152s were fitted with Rustsatze ( field conversion kits ) in the factory with FuG 125 Hermine D/F for navigation and blind landing, LGW-Siemens K 23 autopilot, and a heated armorglass windscreen for bad-weather operations. The pilot's cockpit was pressurized, the rivets around the cockpit skinning being sealed with DHK 8800 paste, the sliding canopy hood sealed via a circular tube filled with foam rubber which was inflated by a compressed air bottle, while the engine compartment was also sealed with a foam rubber ring. A Knorr 300/10 air compressor provided the pressure, maintaining the cockpit pressure at .36 atmospheres above 8,000 meters. To prevent fogging, the windscreen was of a double-pane style with an 8mm thick outer pane and a 3mm inner pane with a 6mm gap between the two with Silicagel capsules, eight in all. The MW 50 injection system was standard with the GM 1 method planned for future incorporation. Total tankage of fuel was 595 liters for the H-0 model with the option of a 300 liter, underbelly drop tank. The H-1 model had even more fuel in six unprotected bag tanks in the wings, totalling 470 liters, of which one of the tanks served as the MW 50 injection tank. The H-1 could use the 300 liter droptank as well as a 600 liter droptank. Weapon fits, in addition to the above, could include unguided rockets, such as the R4M, mounted under the wings. Free-fall bombs, however, could not be used given the mission of the Ta 152H series. The pilots who flew the Ta 152 H in battle were very pleased with it. The aircraft was well able to battle the P-51D "Mustang" as well as the British Hawker "Tempest", several of these allied aircraft falling to the guns of the Ta 152. Despite the fact the Ta 152 H was ment to combat high-altitude allied bombers, almost no missions of this type were flown by those units who operated the aircraft ( notably, III/JG 301 and Stab JG 301 ). The first mission undertaken by III/JG 301 on March 2, 1945 was to intercept U.S. bombers heading for the Bohlen chemical plant near Leuna. It ended when pilots of a group of Messerschmitt BF 109s mistook the new German aircraft for the enemy and engaged them. No losses were incured and the superior climbing and agility of the Ta 152 H allowed them to evade all of the "attackers". Following this, most of III/JG 301 was involved with battling allied fighters, not bombers...the final victims of the Ta 152s guns being Russian Yakolev Yak-9s during the final days of battle around Berlin on April 30, 1945. That the Japanese sought to purchase, and did so, the technology of the Ta 152, was logical in the sense that it was they who had to battle the B-29. It was folly, however, to think that Germany could ship anything other than paper plans to Japan and even then, the chances of the plans making it to Japan were quite slim. And even if the Japanese were able have the blueprints in hand ( I say this since it was not known if, following the purchase, if the schematics and detailed plans were even shipped ), the ability to produce the aircraft was not very likely given the situation already at hand with the Japanese aviation industry and the state it was in. This is not to say that local adaptations would not have occured and would very likely have been the case so had the Japanese built the Ta 152, it might have looked remarkably the same or it may looked similar, but not 100% true to the design. The aircraft, however, would have provided the Japanese with a superior high-altitude fighter, far superior to those they had in the design stage or currently with operational units. The Kawasaki Ki-108, a twin-engined, single-seat high-altitude fighter in the development stage from 1944-1945, could muster only 373mph at 32,810ft. The Mitsuibishi Ki-83 program, another twin-engined design, would have faired better had it made it into production, able to produce a maximum speed of 438mph at 29,530ft. As it was, bombing attacks by the very same planes it was ment to stop disrupted testing to the point that only four prototypes were ever built. Inherently, twin-engined designs cause a reduction in performance due to the higher weights and drag induced by having two engines ( in the case of the Ki-108 and Ki-83, the engines were mounted conventionally on the wing ) thus, the Nakajima Ki-87 sought to use a single engine to achieve a projected top speed of 439mph at 36,090ft. which was better in terms of material usage when compared to the Ki-83 and matched the latter's performance. However, the Ki-87 was tormented with problems, notably the engine and the turbosupercharger and the special landing gear arrangment ( forced upon the designers who had to load the wings with weapon fits and tankage ). Only one was built and though handling was deemed good, top performance was never measured, in part due to the fact that the landing gear was never retracted, lest it fail and cause damage to the aircraft. In all cases, even the Tachikawa Ki-94 on exhibit in this site, did not lead to an aircraft deployed to combat units nor did they lead to any aircraft of a similar mission which could match the performance of the Ta 152. Hence, Japan again sought German aid to quickly provide a solution to a problem...but the solution was much too late to save the nation of Japan from the ravaging of the B-29s. Wing Area 250.8 sq. ft.